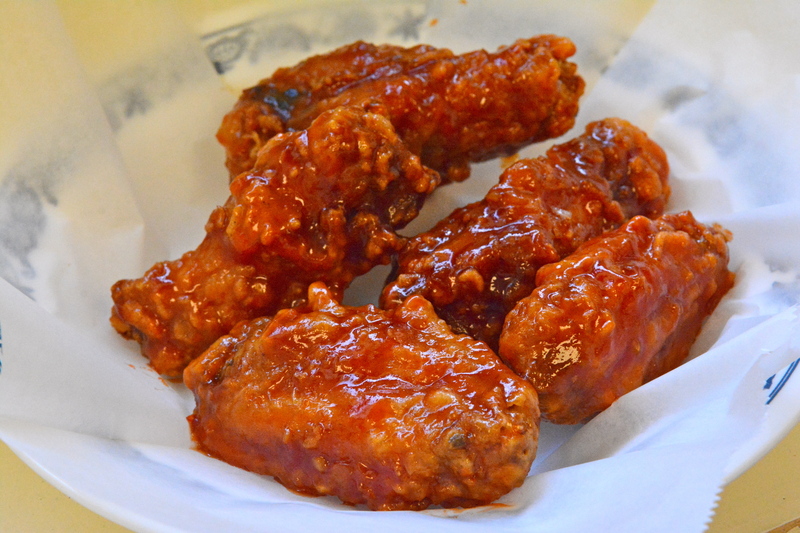 Beware BonChon, KoChix is addictive. A corner joint the size of a rich person’s walk-in closet is KILLING it at Korean-style fried chicken in Bloomingdale. Sure, the menu’s small too – but it doesn’t make the Best Thing on the Menu: Hot Honey Spicy Wings any less impressive. Hot honey spicy wasn’t even an original sauce option, but DC demanded something with a little more heat, and owners Karen and Young Park kindly obliged. The wings come in orders as small as five and as ambitious as 40. As an added bonus, you can choose if you want wings, drums or a combination of both. If you’re on a diet, stop reading here. Otherwise, forge ahead to learn that the secret to these badass bones of bliss is that they’re fried twice. Your teeth cut through two layers of crackling breading before they hit any pollo, and the super sticky sauce is the kind of mess you want to find yourself in on a Saturday night. Unable to get your wing-craving self to Bloomingdale? Fear not, KoChix is one of many sweet spots to join Caviar, a fun and reliable delivery service. If all of that gushing wasn’t enough to convince you to order a wing (or 40), here’s a ringing endorsement from one of DC’s finest food personalities. Please nominate Best Thing on the Menu as best local food blog. Voting closes Friday. Cheers! Hot Honey Spicy not your BTM? Share your favorites in the comments section. There are hundreds of reasons to get yourself down Rhode Island Ave. to The Red Hen. This charming, edgy and entertaining spot has helped put Bloomingdale on the map. 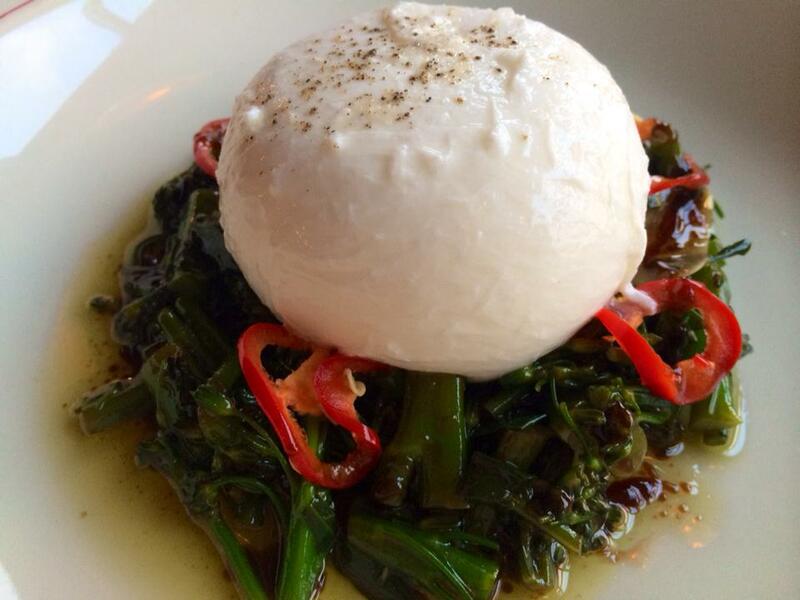 We’ll stick with just a few reasons though, starting with The Best Thing on the Menu: Burrata with Broccolini Marinati, Pickled Red Chiles, Mint & Vin Cotto. Burrata, Buffalo mozzarella’s brother from another mother, is super soft and oozes cream when pierced with a knife. Instead of going the tomato/basil route, Chef Mike Friedman surprises diners with bitter broccolini and peppers that manage to be sweet, sour and spicy. You’ve been warned; once you go burrata you never go back. There’s also something special to drink at The Red Hen. We’re willing to bet our burrata that you haven’t tried orange wine. Whether it’s a trend or just a fad remains to be seen, but it sure is luscious. There are eight different orange wines to choose from at the restaurant, hailing from Slovenia, Croatia and Italy. The taste will take your breath away. Did someone fortify your wine with Scotch? Is there actually a full bouquet of flowers from UrbanStems in there? No, in fact, orange wine is simply made by producing white wine more like red wine, where the stems, skins, seeds, etc. have a longer maceration period. 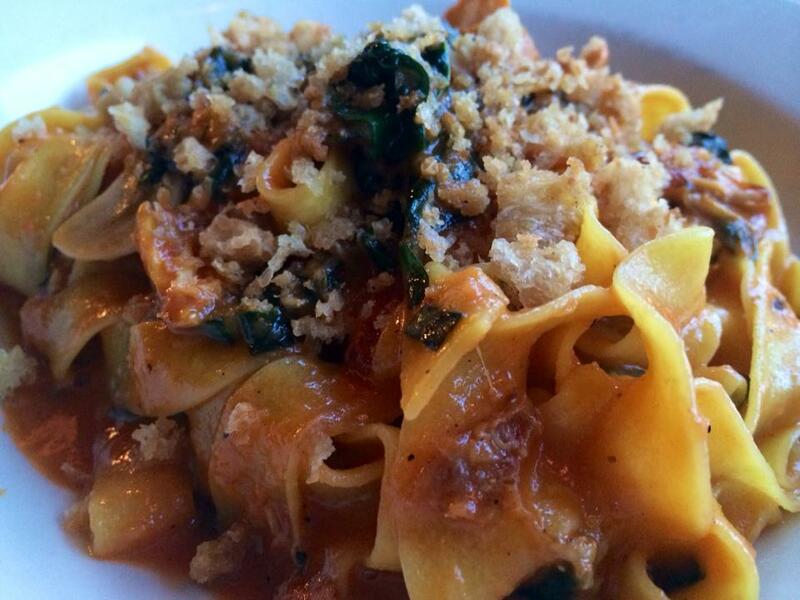 Pair your first glass of orange wine with The Best Pasta on the Menu: Saffron Fettuccine with Rabbit Sugo, Cinnamon, Grilled Kale & Mustard Breadcrumbs. Let’s all admit that rabbit is the new duck. And, according to the Twittersphere, duck is the new pork belly. Rabbit, though totes adorbs in the flesh, is elegant and perfect for pasta. This brilliant bowl is a bit autumnal, so we hope to eat it come October (Read: Please keep on the menu!). 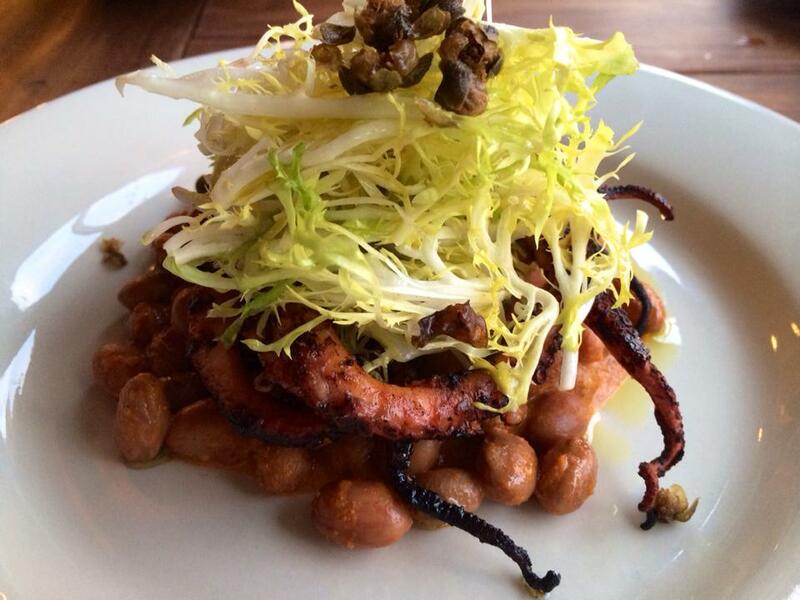 One last can’t miss dish is the Grilled Octopus with Shelling Beans, Frisee, Crispy Capers & Romesco Sauce. The octopus is flame kissed and super smoky and Romesco is the best sauce, it just is. Though an appetizer, the octopus dish is the perfect size. We have a special appreciation for The Red Hen because it bridges the divide between small plate lovers and big plate purists by offering medium-size plates that can in fact be split among friends without feelings getting hurt. Click here for more photos of the meal. Burrata not your BTM? Post your favorites in the comments section. DC’s gearing up for a sweaty, smoky, artery-busting Meat Week 2014. 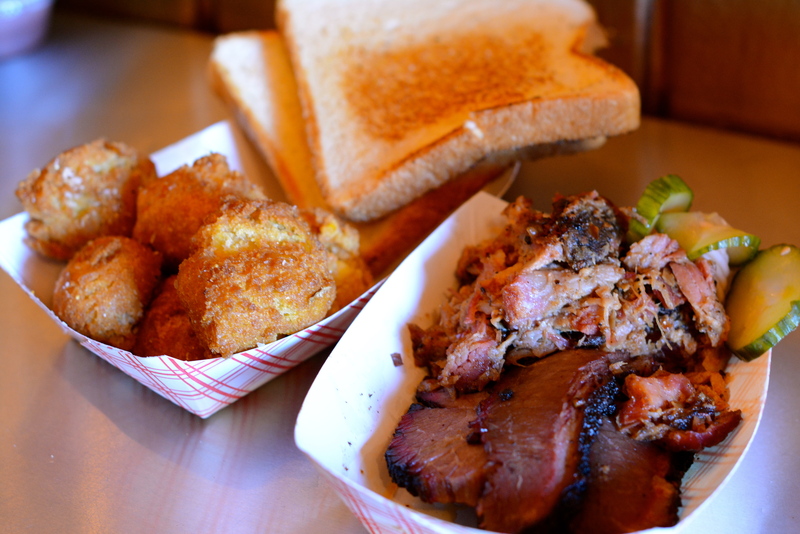 One of the featured meat magicians is none other than BBQ newcomer DCity Smokehouse. This four-seat cubbyhole of heaven can be found right around where Florida Ave meets North Capitol Street NW. Use your nose to guide you the rest of the way. As far as the Best Thing on the Menu, go all out and get the Smokehouse Meat Platter: 1/2lb of any sliced or chopped meat or combination of 2 meat with one side, house made pickles, & Texas toast. Select the hush puppies as your side if you know good food when it stares you in the face. We went with brisket and pulled pork, but there’s pork belly and turkey too. You can trust Pit Mater Rob Sonderman with all your BBQ needs; he took the reigns at DCity Smokehouse after leaving Hill Country BBQ in Penn Quarter, and has really injected new life into the neighborhood. 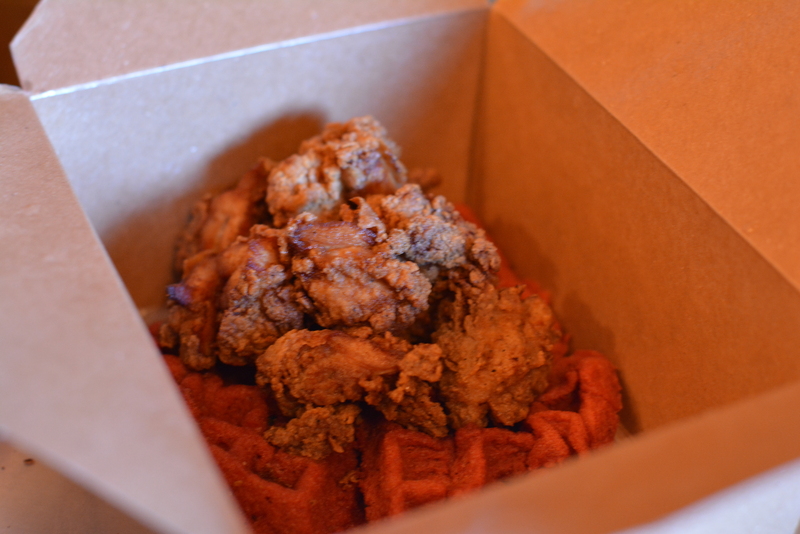 Those who prefer poultry also have a killer option: Crispy fried boneless chicken & red velvet waffle with bourbon syrup. A definite BTM runner up. This dish was a Revive Catering and Events original. If you’re lazy when it comes to BBQ, not to worry. Rather than cruising down Florida Ave, just use your mouse to navigate to Seamless for delivery. Keep them in mind for Super Bowl orders! Smokehouse Meat Platter not your BTM? Share your favorites in the comments section.